The kids MMOG genre is becoming serious business, with Dreamworks launching a new multi-million dollar online game starring Kung Fu Panda. 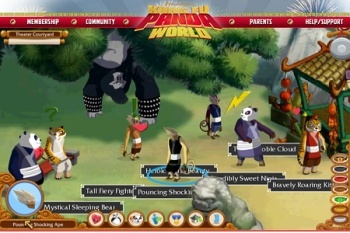 Dreamworks officially launched Kung Fu Panda World this week, an online game aimed at 8 to 12-year-olds that will go up against competitors such as Club Penguin and NeoPets. It's based on the movie of the same name, minus the "World," which was released in June 2008. When I first heard of Kung Fu Panda World, I thought it would be a simple browser game with mini-games to play and afros to buy for my character. The surprising thing about it is that Kung Fu Panda World is a 2.5 year project that cost over $10 million to develop, so it may have more depth than would first be expected. It operates by a free-to-play model if you watch an advertisement, so I'd give it a try if I could, but the world of Kung Fu Panda is too popular at this time for me to even log in. A $5.95 per month subscription plan is also available. With a Kung Fu Panda sequel due next year, Dreamworks wanted to give consumers a way to simulate the journey of Po, the movie's main character. Players will pick a fighting style, customize their characters' looks, and play games to unlock abilities, items, and more games. Coins can be earned that are used to purchase items such as scrolls and clothing, and the goal of the game is to rise to the top of the sash rank, like the rise to black belt in martial arts. Dreamworks plans to add more games and locations in the future, and may let kids vote on what kinds are incorporated into the game. Kid-friendliness was key in the development of Kung Fu Panda World, with an easy interface designed specifically for kids, a design philosophy that teaches kids how to quest, and parental controls that ideally will stop children from seeing the words f*ck, sh*t, and terms such as m*therf*****g sh*rtf*ce b*lls. Parents can also play and earn in-game items for their offspring. Dreamworks isn't stopping here, as the company has a How to Train Your Dragon MMOG in the works as well. Companies are finding more and more ways to squeeze money out of kids these days. Whatever happened to going outside and playing a nice free game of Ring Around the Rosie?